Auckland City became the New Zealand Premiership champions for a record-breaking seventh time after earning a 1-0 win over Team Wellington in the final at QBE Stadium in Auckland on Sunday. The Navy Blues, who secured their ninth minor premiership in the regular season, won the title for the first time in three years when they outlasted defending champions Team Wellington in a hard-fought final in fine conditions. Callum McCowatt, one of the players of the ISPS Handa Premiership season, came up with the decisive strike in the 83rd minute to get Auckland City’s fanatical fans on their feet. The youngster gathered the ball from a well-weighted Cam Howieson pass and then slotted home a fine finish across Scott Basalaj’s goal. From there, they never looked back and secured a long-awaited seventh title. 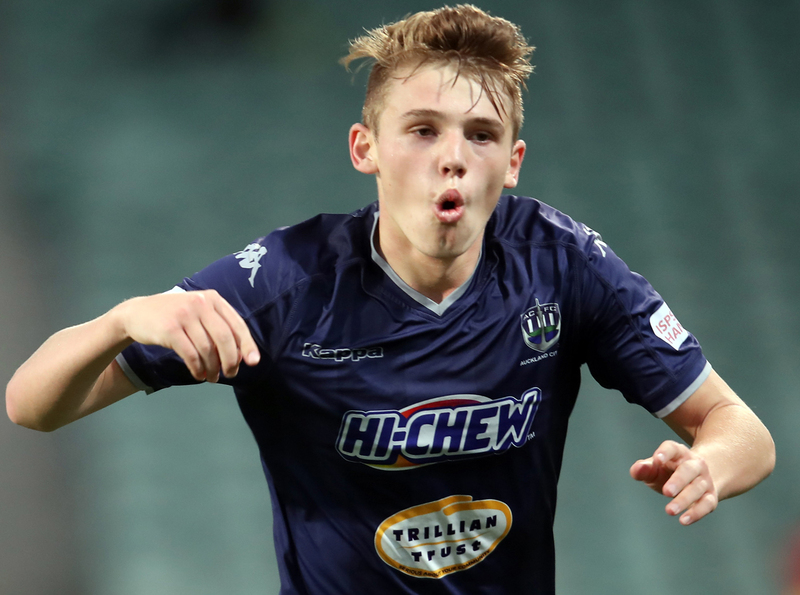 The 18-year-old McCowatt’s late winner sent the Navy Blues support into delirium capping off a brilliant breakthrough season at domestic level for the Ole Academy graduate. “It feels good to win a close match like that. The game was unbelievable and we came out on top. It’s a great feeling to end our grand final drought. “The match was cagey and it was tight in the first half with not too many chances but as people got tired in the second half the game opened up and there was a lot more space to work in,” he said. McCowatt, who notched his 11th goal of the season when his drive left Scott Basalaj helpless, also picked up the Steve Sumner Trophy, the newly introduced award for ISPS Handa Premiership grand final Most Valuable Player. “I’m delighted to have won the Steve Sumner Trophy – but I’m just happy we won the game. I’m not much of one for individual accolades but I’m glad this trophy has been integrated into the ISPS Handa Premiership grand final for a great like Steve Sumner,” he said. The victory for Auckland City makes history for the proud club – they earned a record-breaking seventh national league title, taking them past Mt. Wellington and Christchurch United on the all-time list. Both sides knew each other well and there was nothing separating them for most of the match with clear-cut scoring chances hard to come by. Team Wellington began brightly and hustled in the first 20 minutes to create some half chances. Andy Bevin, the club’s joint top scorer this season alongside Jack-Henry Sinclair, found some space on the right of Auckland City’s box in the 17th minute but dragged his shot wide. The Navy Blues finished the stronger of the two sides and had the better opportunities to open the scoring. They enjoyed a good period of possession and territory in the final 15 minutes of the half with Emiliano Tade and Darren White becoming prominent. The best chance of the half fell to Tade in the 32nd minute when he gathered the ball inside the box and cut onto his right foot but his powerful shot was blocked at close range. Three minutes later, the six-time champions were on the attack again when Howieson found space down the left wing. The recently called up All Whites midfielder delivered a great cross to the head of Kris Bright but the big forward could not get his effort down on target. The sizable presence of Bright caused Team Wellington problems in the 39th minute when he found Tade in the box and the Golden Boot winner produced a turn and shot but his effort was just off target. After the break, the evenly-fought nature of the game continued with chances at either end. Team Wellington had their best opportunity of the match when Andy Bevin created an intercept in the middle of the park. He found Jack-Henry Sinclair but the youngster took a tad too much time before shooting and his effort was blocked. Auckland City came straight back and could have taken the lead when a corner found Tade at the back post. He connected with a good header but Basalaj was on hand to clear from the line. With 20 minutes to play, Auckland coach Ramon Tribulietx made a double change with Fabrizio Tavano and Kris Bright being replaced by Mario Bilen and Micah Lea’alafa respectively. The introduction of Lea’alafa made a particular impact, the Solomon Islands international wasting little time getting in on the action. He picked out Tade with a dinked ball in the Team Wellington box but the striker’s touch was too heavy and Basalaj had it under control. Ten minutes later, Team Wellington turned the ball over in a dangerous area and Lea’alafa did not hesitate to pull the trigger on the turn. He tested Basalaj again but the ‘keeper managed a scrambled save. It looked like the ISPS Handa Premiership final was heading to extra time before McCowatt won the game for Auckland City and finished a breakthrough season for the Navy Blues in style. McCowatt’s goal came about following a powerful break by team-mate and recently recalled All Whites midfielder Cam Howieson and the one-time Western Suburbs AFC forward knew instinctively what could happen next. “Cam is great at driving forward with the ball and once I got into the box I knew that if I made a nicely timed run he would slip the ball to me perfectly. I took one touch and luckily it went into the bottom corner. I’ve been practising those so it was great to see it go in. “I’ve enjoyed every moment of my season with Auckland City FC. Its been a lot of fun with my team-mates and under the guidance of Ramon as well. There’s no doubt Auckland City FC is the benchmark for New Zealand club football and long may it continue,” he said.